Makes sense when you look at it that way. No mystery for modern science. Super flares (all elevated GMA) affect biology. You can see how the serum levels of lifeguards who better conform to the primative lifestyles of humans have serum levels of vitamin D akin to wild old world primates above. Due to indoor lifestyles, sunscreen, and skin cancer scare campaigns modern humans have much lower serum vitmain D ranges and higher incidences of vitmain D deficiecny and vitamin D deficiency disease and disorders. In regards to "trade-off" there is a sine-wave for natural serum vitmain D and new science is placing it in the 60-80 ng/ml, range but then most modern humans(%75) are below 30 ng/ml. You can see what is considered "Normal" in Toronto, but then when you sample 1,000 people who are vitamin D deficient to begin with, the "normal" rating will obviously be a deficient number. This is the same problem with a fusion solar model. When you base your observaton in flawed thinking or basis your conclusions are wrong. The serum levels of wild old world primates and lifeguards is empirical data that cannot be ignored. I suspect those healthy range numbers will continually creep into the natural serum ranges exhibited by wild primates and humans with outdoor lifestyles exposing skin to sunlight. Thanks! My wife has been diagnosed previously as vitamin D deficient, but various doctors have been giving us various responses that all seem to be in conflict with each other. This clarifies things greatly! Came across this on Jeff Rense's front page a few days ago. Thought it was appropos, but spaced out posting it until now. Being that D3 is created by the body's exposure to the sun, I think it highly interesting and relevant to scientific inquiry to note that it is a direct cause-effect physical nutrition bridge between a star and our body. Coming across this discussion when I'm in the middle of battling pneumonia is quite curious. How I contracted the infection isn't readily explainable by usual weather patterns. I've never had a respiratory infection come on so quick, nor have I had anything like this for over fifty years. The only thing that comes to mind is the fact I have been spending a great deal of time indoors this last year, and perhaps my immune system has been weakened for lack of sufficient sunlight. One of the other things that strikes me odd, is that a simple two-week daily dose of an "old" antibiotic--doxycycline, arrested the pneumonia and I was cleared by the X-ray staff in less than two weeks. I've rarely been prescribed antibiotics, and have always steered away from drugs to resolve illness except in extreme discomfort. It seems odd to me that in a time when the medical field is now becoming concerned about resistance to antibiotics I was helped exceptionally by an "old" version. Two of my gr grandparents both died suddenly (within 48 hrs) in the 1918 flu epidemic. Investigating any correlation with that and solar flares revealed the sun was transiting its 90 year cycle and producing extraordinary flares, just like we have been subjected to over the last couple of years. I think it would be well worth the investigation to pick up where Chizhevsky left off in his investigations regarding ionization and its biological effects relative to the immune system. I've thought it most peculiar that living organisms can exist within a sea of plasma radiation and not endure immediate severe consequences. I am convinced there is a great frontier of learning to be had in this field of the fourth state of matter. There are a great many answers to long-held questions to come out of it's study, both in the subatomic level as well as the biological. Geomagnetic acivity inspires stress on biology, The response to stress is to access the cellular DNA library for the proper resposnse to the stress stimuli. To access the DNA library a molecule of vitmain D is destroyed. Imagine every cell of the body accessing the DNA library during geomagnetic activity and destroying vitamin D reserves. Vitamin D being critical to immune function. The recent discovery--from a meta-analysis of 18 randomized controlled trials--that supplemental cholecalciferol (vitamin D) significantly reduces all-cause mortality emphasizes the medical, ethical, and legal implications of promptly diagnosing and adequately treating vitamin D deficiency. Not only are such deficiencies common, and probably the rule, vitamin D deficiency is implicated in most of the diseases of civilization. Vitamin D's final metabolic product is a potent, pleiotropic, repair and maintenance, seco-steroid hormone that targets more than 200 human genes in a wide variety of tissues, meaning it has as many mechanisms of action as genes it targets. One of the most important genes vitamin D up-regulates is for cathelicidin, a naturally occurring broad-spectrum antibiotic. 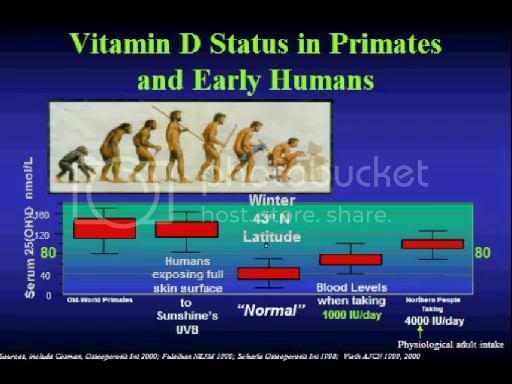 Natural vitamin D levels, those found in humans living in a sun-rich environment, are between 40-70 ng per ml, levels obtained by few modern humans. Assessing serum 25-hydroxy-vitamin D (25(OH)D) is the only way to make the diagnosis and to assure treatment is adequate and safe. Three treatment modalities exist for vitamin D deficiency: sunlight, artificial ultraviolet B (UVB) radiation, and vitamin D3 supplementation. Treatment of vitamin D deficiency in otherwise healthy patients with 2,000-7,000 IU vitamin D per day should be sufficient to maintain year-round 25(OH)D levels between 40-70 ng per mL. In those with serious illnesses associated with vitamin D deficiency, such as cancer, heart disease, multiple sclerosis, diabetes, autism, and a host of other illnesses, doses should be sufficient to maintain year-round 25(OH)D levels between 55 -70 ng per mL. Vitamin D-deficient patients with serious illness should not only be supplemented more aggressively than the well, they should have more frequent monitoring of serum 25(OH)D and serum calcium. Vitamin D should always be adjuvant treatment in patients with serious illnesses and never replace standard treatment. Theoretically, pharmacological doses of vitamin D (2,000 IU per kg per day for three days) may produce enough of the naturally occurring antibiotic cathelicidin to cure common viral respiratory infections, such as influenza and the common cold, but such a theory awaits further science. 1918 was a result of the Gleissberg ramp up cycle. It is a pulse width modulation in my opinion. 1918 is going to come around again in solar cycle 26 in my opinion. * I enjoyed the 1859 story. There needs to be a collection of all such similar stories. Some similar ones I've heard of are the 1812-1813 earthquakes from the New Madrid faults, the 1817 freezing summer, the 1871 Chicago fire event and the 1908 bright sky Tunguska event. * It's odd that UV-A and UV-C are somewhat harmful to humans, but UV-B, which is between the two in wavelength or frequency, is healthful, by producing vitamin D. I wonder if Saturn produced much UV-B light, when Earth was one of its moons. * Dr. Mercola [http://mercola.com] has been reporting on the latest findings on the value of vitamin D for several years. He has said pretty much all along, I think, that mid-day sunshine has the most UV-B light and that clouds block it. Lately he stated that the Sun has to be at least 50 degree above the horizon in order to get enough UV-B light from it to produce much vitamin D. He and others also say that the real cause of most skin cancer is toxic chemicals in sunscreens. * And anyone who takes antibiotics also needs probiotics; otherwise fungus takes over in the gut. Sodium chlorite [not chloride] is better than most antibiotics and doesn't seem to harm intestinal flora. Sodium chlorite is made by electrolysis of saltwater, so I theorize that, in the Saturn System, Earth was electrified enough to produce enough sodium chlorite in seawater to make most sea creatures immune to most bacterial and micro-organism-causing diseases. A UVB photon cleaves a cholesterol molecule creating vitamin D.
The interesting part is that when there are more molecules of vitamin D in the skin than cholesterol molecules the UVA photons then cleave the vitamin D molecules preventing excess vitamin D.
Beautifully elegant, simple system. A balancing act between UVA and UVB leading to optimal levels of vitamin D being maintained via UVR in the wild model. Civilization does screw up the wild model however. Sometime between 1,237 and 1,238 years ago, the earth was inundated by a massive blast of high-energy radiation greater than any known to have occurred either before or since – but no one knows its source. This startling fact was uncovered by tree-ring analysis – the same technique that has proved so useful to climate scientists as they attempt to reconstruct temperatures before the narrow band of time for which we have accurate instrumental readings. The telltale indicator of the massive energy burst is a remarkably sudden jump in the amount of the radioactive isotope carbon-14 (14C) found in tree rings that were formed during the 775 A.D. growing season in the earth's northern hemisphere, according to the announcement of the findings on Nature.com. The tree-ring analysis and its results are described in a paper published on Sunday in the online version of the journal Nature, written by three Japanese scientists from Nagoya University's Center for Chronological Research, and one from that same school's Solar-Terrestrial Environment Laboratory. "We argue that neither a solar flare nor a local supernova is likely to have been responsible" for the burst, say the paper's authors, citing the two most likely sources for such an immense surge in high-energy radiation. The authors' skepticism is well-founded. The increase in 14C detected during that growing season's tree rings is about 20 times that which is normally found in such sampling. A supernova of that magnitude would surely have been noted by contemporary writers – and none was* – and a solar flare creating that much radiation would likely have wiped out the Earth's ozone layer, "with devastating ecological consequences," according to Nature.com. For those Reg readers whose remembrances of their college astrophysics is a wee bit rusty, 14C is created when energy from space hits high-atmospheric atoms and produces neutrons, which then smash into nitrogen-14, which in turn decays into 14C. This is an ongoing process – in fact, as Nature.com reminds us, the presence of 14C is what allows us to perform the now-prosaic task of radiocarbon dating. That normal, steady, day-to-day 14C creation spiked by 1.2 per cent during the 775 A.D. growing season – a massive increase in what is otherwise an exceptionally stable system – and now appears in the tree rings studied by the Nagoya researchers. "The work looks pretty solid," space physicist Daniel Baker of the University of Colorado's Laboratory for Atmospheric and Space Physics told Nature.com of the researchers' paper. "Some very energetic event occurred in about AD 775." The question, of course, is what exactly was that "very energetic event." A supernova that would have been capable of producing the energy required for such a jump would likely have been so bright that it would have been able to be seen during the day. An equally energetic solar flare would've had to have been massively larger than any storm detected since such observations began a century and a half or so ago – not to mention that it would have produced auroral displays of such brilliance that they almost certainly would have been commented upon by contemporary observers. The University of Colorado's Baker, however, told Nature.com that he wouldn't rule out solar flares entirely, noting that some of those events are accompanied by coronal mass ejections (CMEs) – ludicrously humongous plasma explosions that fire high-energy magnetically charged particles at the earth. "We know much more these days about how important proton acceleration is at the shock fronts that precede CME structures as they propagate towards Earth," Baker said. "I would like to think about whether a strong CME moving directly towards Earth could have produced the intense proton population that impacted Earth's atmosphere" and led to the spike in 14C. Not being bound solely by the strictures of scientific analysis, we at The Reg would like to postulate a third possibility. Perhaps – just perhaps – some hot-rodding alien flashed by the earth at near light speed during the 775 A.D. growing season, and we caught a whiff of his high-energy exhaust. Or not. Other ideas – equally ludicrous or perceptively analytical – are solicited in Comments. Speaking of comments, one reader of the Nature.com announcement of the researchers' paper noted that there was, indeed, a contemporary mention of a celestial display during the time in question. The Anglo-Saxon Chronicles note that in 774 A.D., "This year also appeared in the heavens a red crucifix, after sunset." Another points out that the Cyclopaedia of Biblical, theological, and ecclesiastical literature, Volume 9 notes that the hidden, martyred body of the rather obscure Irish saint, Rumoldus, was discovered when "Celestial lights marked the place where it lay." Unfortunately, a scholarly 1922 paper on that miraculous event better defines the legend as noting that said display was merely "a mysterious flame of light" that hovered over the river where Rumoldus had been dumped, alerting some fishermen. The 14C tree-ring mystery continues. the earth was inundated by a massive blast of high-energy radiation greater than any known to have occurred either before or since – but no one knows its source. Well, I guess a conclusion of "since" is valid, but C14 dating of tree rings can only go back a few thousand years. Or can dating be done on fossilized trees and estimate a time frame when they lived? I'd like to see a world-wide measurement of tree rings that were formed in 775 AD. Perhaps there is a likely direction in space that the radiation came from. Also this measurement might indicate a CME was involved, and if so, that it might happen again in our time. Such a radiation burst now could cripple humanity wiping out the electricity grids. Also it shows us how the datings from thousands of years ago would be all wrong if electrical conditions were greater then, and we know that the magnetic field was much greater then. We need to know more about this. Tom (tolenio), thanks for the insight in your original post. You are right, the weather event,and the Carrington event are both electrical, and they are related. Once you understand the cause of each event, you will see that the weather is not necessarily a precursor to the solar event, however. 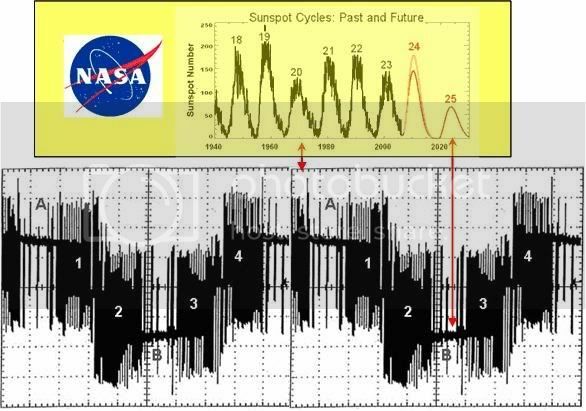 There is work showing that the solar cycle is related to the motion of the sun around the center of mass of the solar system. See http://tmgnow.com/repository/solar/percyseymour2.html , for example. The Carrington event occured in a year where most of the planetary mass (Jupiter and Saturn) were on the same side of the sun during the cycles peak, so the sun's motion around the center of mass was more pronounced. These guys are right about the suns motion, but they are missing EU's galactic model. They will be wrong about the mechanism for solar cycles if they are only considering gravitational, tidal forces on the sun. Still, an important read for any EU theorist! 2. We live in an electric universe. The sun spirals around the center of the solar system. The sun not only moves up and down through the galaxy, but since the planet's orbital planes are not in the suns rotational plane, the sun must be moving up and back along it's spin axis (current filament). Since the sun's VELOCITY, (not position) in the galaxy is important, we can not ignore the galaxy when considering the sun orbiting the center of mass of the solar system. Am I about right so far? Now consider the weather event of June 17, 1859. If you have access to Starry Night or other astronomy software, look at the position of sun, major planets (especially Jupiter), and the galactic plane. Ask yourself "Where is earth compared to the center of mass of the solar system?" and "How is earth moving around that center, in the galactic reference frame?" What you will find is the following: that weather event on earth was not caused by anything on the sun. The same thing that happened to the earth in june, happened TO the sun in the fall. Just as the sun's motion around the center of mass causes solar cycles (weak in years where,say, jupiter and saturn are on opposite sides of sun, stronger when jupiter and saturn are together on one side), the earth's extreme motion perpendicular to the galactic plane caused extreme weather.